Yes, this was initially one of those westerns with a title ending with an exclamation point (!). No, it’s not a particularly good sign here, either. Fess Parker spent the middle years of the 1950s as the most celebrated frontiersman in the American media: Davy Crockett on a series of Disney television specials, some of which were also released as movies. He inspired a craze for ersatz coonskin caps and other Crockett regalia and toys among children in the U.S. In the 1960s he would go one to great success as Daniel Boone, also on television. Handsome, silver-haired Jeff Chandler.spent most of the 1950s as a leading man in movies, including a number of westerns, either as the noble Apache chief Cochise (Broken Arrow, The Battle of Apache Pass), an Alaska gold miner (Roy Glennister in 1955’s The Spoilers), or a cavalry officer (The Great Sioux Uprising, Two Flags West, War Arrow, Drango). Two years after the release of The Jayhawkers! Chandler would be dead at the age of 42. Now it might seem strange to see Fess Parker as the good guy and Chandler as the villain, but Fess Parker was a big name in westerns in the 1950s. Here Parker plays Cam Bleeker, a former Missouri raider who breaks out of a federal prison and makes his way back to his farm in Kansas. It is just before the Civil War, when raids and counter-raids back and forth across the Missouri-Kansas border gave the area the nickname “Bleeding Kansas.” Bleeker finds his farm, but not his wife, who has died while he was imprisoned. Collapsing from wounds received during his escape, he is nursed back to health by Jeanne Dubois (Nicole Maurey), a French (!) widow with two small children, who now owns the farm. While recuperating, he bonds with the family and learns about how his deceased wife ran off with another guerilla leader, who then abandoned her. Left to survive however she might, she took to alcohol and other forms of degradation and died of pneumonia. Jeanne Dubois (Nicole Maurey) nurses an escaped convict back to health. 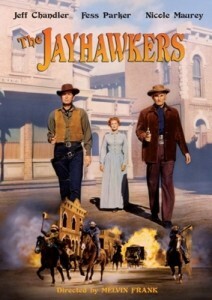 The military governor of Kansas recaptures Bleeker and makes him an offer. Prominent among those with their own agendas for Kansas is Luke Darcy (Jeff Chandler), who has his own quasi-army of Jayhawkers and wants to set up his own republic of Kansas. If Bleeker will go undercover, join Darcy and deliver him alive to the governor, Bleeker will have his own freedom. Bleeker further learns that Darcy is the man who had debauched his dead wife. Bleeker gains access to Darcy by saving Jake (Leo Gordon), one of Darcy’s men, from hanging. Darcy is not a trusting man, and his gunslinger Lordan (Henry Silva) has suspicions, too. Meanwhile, Bleeker works his way up in Darcy’s forces, reading from his small library and debating principles with Darcy. Lordan goes back to Bleeker’s farm near Knight’s Crossing, meets Jeanne, attacks her and learns the some of the truth about Bleeker’s motivations. He then makes arrangements for the local sheriff and a posse to find Bleeker during a brief visit there. Lordan (Henry Silva) assaults Jeanne but doesn’t have time to finish. Bleeker continues to have his ups and downs within Darcy’s organization; when Lordan presents his evidence, there is a shootout, ending with Jake dead and Lordan fleeing. Darcy leads a raid on Knight’s Crossing, in which Jeanne’s daughter is trampled by a horse, and Bleeker insists on taking her to a doctor in Abilene. While in Abilene, Bleeker learns that there will be an unusually large cattle sale there, with more than half a million dollars coming in on the train. He organizes a raid and a trap for Darcy. Now in favor again with Darcy, Bleeker is to plan and lead the raid on Abilene. Jeanne, staying in Abilene with her daughter, goes to Topeka to coordinate the trap with the governor. Lordan sees her there and is suspicious. Bleeker smuggles guns into Abilene in hay wagons, and Darcy’s men enter the town by twos and threes. As the train arrives, so does Lordan, and he exposes Bleeker’s plan to Darcy. Bleeker and Darcy fight it out in a saloon while the trap closes. Finally Bleeker takes down Darcy, who will be hung. Rather than let him hang, Bleeker shoots Darcy and therefore can’t deliver him to the governor alive, as promised. The governor nevertheless pardons him, and he goes back to the farm with Jeanne. 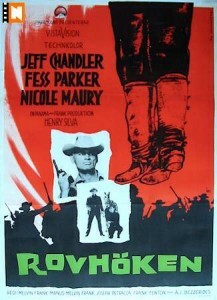 Bleeker (Fess Parker) and Darcy (Jeff Chandler) finally have it out in a bar in Abilene. The story depends on the attractiveness of Darcy, and Chandler plays him well. But Darcy is not written very consistently, and although Bleeker is sometimes taken with him and his big ideas, we are not so fond of him. His views on women seem very unenlightened in our feminist age, and they must have been at least somewhat offensive in the 1950s. There seems to be no reason for Jeanne to be French in frontier Kansas, and Nicole Maurey wasn’t well known enough to make her much of a draw. 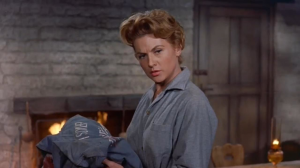 She joins several more notable French women in westerns: Denise Darcel in Westward the Women and Vera Cruz, Capucine in North to Alaska, and Jeanne Moreau in Monte Walsh. This is watchable but not all that memorable, and the inconsistencies in tone and story can be frustrating. The movie is not often seen these days. 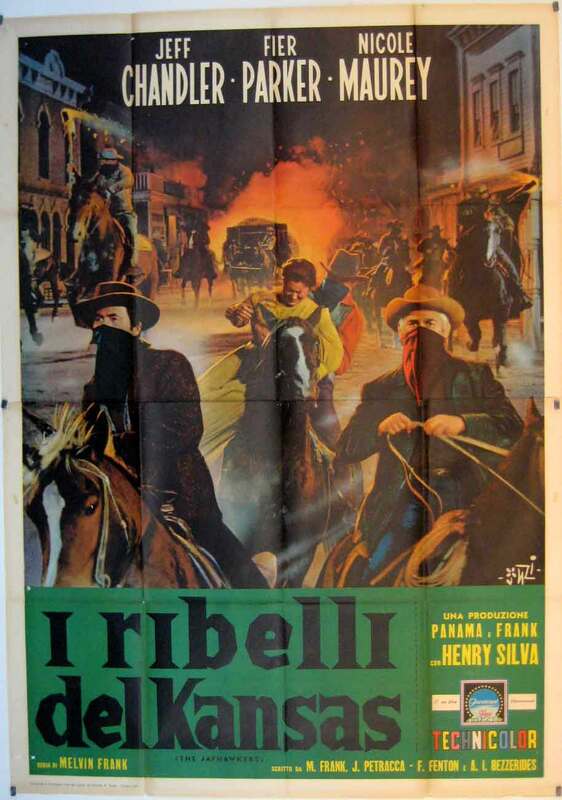 Henry Silva had a good run as a persuasive villain in several good westerns in the 1950s. Look for him in The Tall T with Randolph Scott and Richard Boone, The Law and Jake Wade with Robert Taylor and Richard Widmark, in The Bravados with Gregory Peck, and Ride a Crooked Trail with Audie Murphy. Perhaps the best element of the movie is the score by Jerome Moross, who had also done the music for The Big Country. If the theme sounds familiar, it was later reworked by Moross as the theme for the television program Wagon Train. If the terrain doesn’t remind you much of Kansas, that’s because it was filmed in southern California. The excellent color cinematography is by Loyal Griggs, who did Shane. Available on DVD since 2012. For more Fess Parker on film, see him in Disney’s Old Yeller (1957), with Dorothy McGuire. 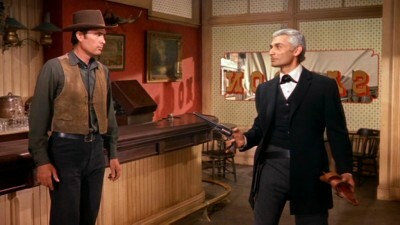 This entry was posted in Westerns Worth Watching and tagged Civil War, Jeff Chandler on June 23, 2014 by Nicholas Chennault.